My husbands company picnic is today so I spent last night making a special pie to enter into their baking contest. 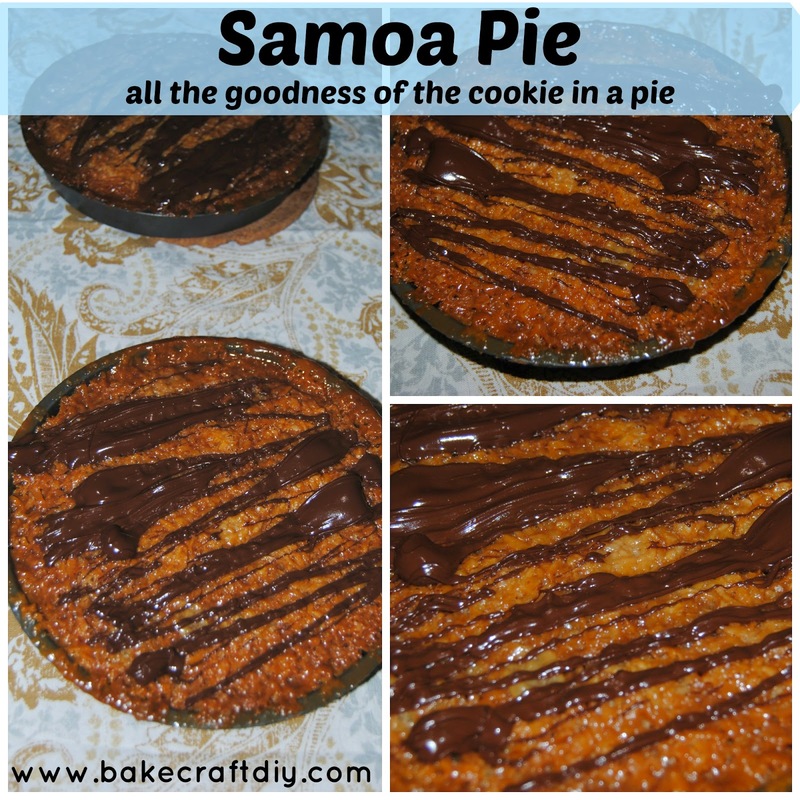 I gave my husband a list of about 75 pies and the Samoa Pie is the one he chose, after all I promised I would double the recipe so he could have one too! The recipe calls for salted caramel you can purchase this or make your own the recipe is included at the end of this post. -Bake the cookie crust for about 10 minutes or until the middle begins to look firm and the outside bubbles (like the edges of a pancake). -Remove from the oven and evenly sprinkle 3/4 c of chocolate chips over the crust, then add the coconut evenly spreading, add the condensed milk on top of the coconut and the salted caramel on top of that. Fear not if your pie looks liquidy the coconut absorbs some of the liquid and the rest evaporates. -Put the pie back in the oven for about 20-25 minutes, until the coconut topping begins to look dry and a nice golden color. -The pie will finish cooking while it cools. Wait at least 4 hours before serving. TIP- my pie boiled over (you can tell when you look at the edges of my pan) to prevent the messy oven clean up I am about to endure I recommend putting a tin foil covered cookie sheet on the rack beneath your pie to catch any potential drippings. This was super simple, and very delicious. PLEASE wear an oven mitt for the 2nd part of the caramel sauce, it gets steamy! -Whisk until fully combined, it will be pretty liquidy. Allow it to boil for an additional minute then remove from heat and pour into a jar. Leave the jar open to allow it to cool to room temperature then add a lid if saving. Now enjoy the sweet deliciousness that is a Samoa Cookie year round as a fresh pie.